Sawat dee krop / greetings, friends! I am inviting you to join me on this 12-day Thai Yoga Massage + Cultural Adventure from February 14-25, 2020. Now is the time to start planning! Over the last 22 years, I have traveled to Thailand 12 times to study, expand my world, and to explore the unique regions of this truly amazing country. As a result, I have created an experience for you that is authentic, engaging, varied, organized + affordable. This all-encompassing experience is targeted to those seeking professional development, personal development, and a unique cultural experience. I have carefully designed our itinerary to maximize our time in Thailand + have negotiated group discounts, which I am passing along to you. As a result, a minimum of 12 people is required for this journey to occur. Below is all the information detailing the components of this unforgettable experience. I invite you to take your time reading through it, viewing the pictures, and imagining yourself on this journey. Adult companions are welcome to join at a discount if they’re not participating in the Thai Yoga Massage courses. I look forward to traveling with you + sharing a wonderful life experience together! Feel free to contact me with any questions you have. Eric Spivack is a Nationally Certified Massage Therapist + NCBTMB-Approved Continuing Education Provider, as well as, an East Asian Medicine Practitioner, Certified Viniyoga Instructor + Ayurveda Health Coach. He has taught Thai Yoga Massage workshops for over 22 years and has presented courses throughout the United States and at the Washington state + national American Massage Therapy Association conventions. Eric has been to Thailand 12 times to study with a wide variety of teachers and holds certificates from many Thai institutions. He is considered a fun + attentive instructor who has a deep passion for teaching. Prerequisites: None. The Journey to Thailand / Thai Yoga Massage course is open to everybody, whether you are new to Thai Yoga Massage or have been practicing for awhile. If you have previously attended my Level 1-3 Intensive workshops, this is a wonderful opportunity to relearn/review the material, while having the opportunity to practice integrating it into a larger sequence. Plus, you gain the cultural experience of being in Thailand. Course Description: Thai Yoga Massage is an elegant + interactive form of meditative bodywork that combines assisted yoga stretching, acupressure, gentle rocking + rhythmic compression along energy lines. In all modules, participants will learn to effectively use their hands, forearms, elbows + feet to open and gently release blockages that inhibit the flow of energy. Fundamental techniques applied in the supine, prone, side-lying + seated positions will be taught. Participants will receive a complementary workbook with photographs + detailed descriptions of all poses taught. By the end of this course, you will have learned enough poses to successfully give a 3-hour full-body Thai Yoga Massage session. The course will have lecture + demonstration with the majority of time being hands-on experience. Class will begin each day with a yoga warm-up routine. Participants will receive a Certificate of Completion for 54 NCBTMB + Thai Healing Alliance International CE hours. You will arrive at the Bangkok airport + take the complimentary airport shuttle to your 4-star boutique hotel. Before our group dinner, you may check out the gym or rooftop spa where you can relax, receive a Thai massage or swim in the pool. A delicious buffet breakfast + lunch are included each day we’re in Bangkok. Our hotel has an award-winning restaurant, which proudly serves Thai, Indian + International cuisine. After a delicious buffet breakfast, we will be driven to the ancient city of Ayutthaya, a UNESCO World Heritage site + former capital of Thailand. Our tour guide will show us around the Bang Pa-In Summer Palace, Wat Maha That (over 600 years old), the remains of the Palace of Wat Na Phra Mane + Wat Lokayasutharam. 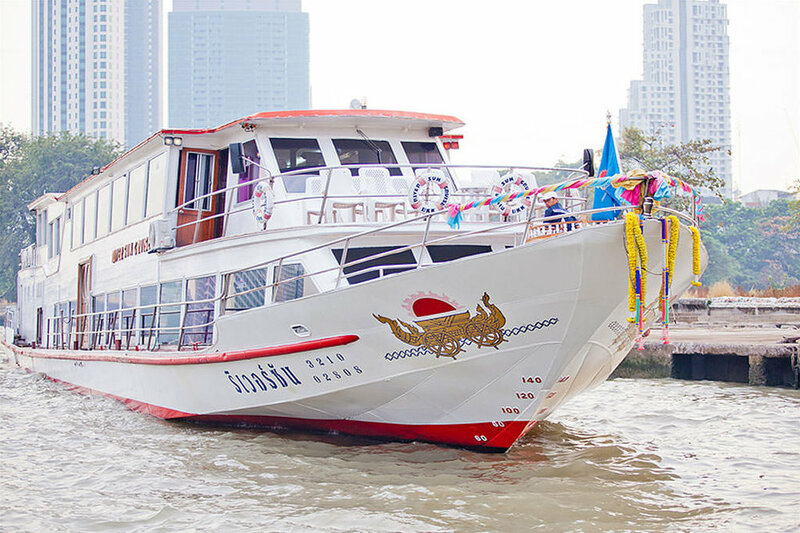 On our return to Bangkok, we will enjoy a delicious lunch buffet as we float along the Chao Phraya River + observe the beauty of Thai rural life. 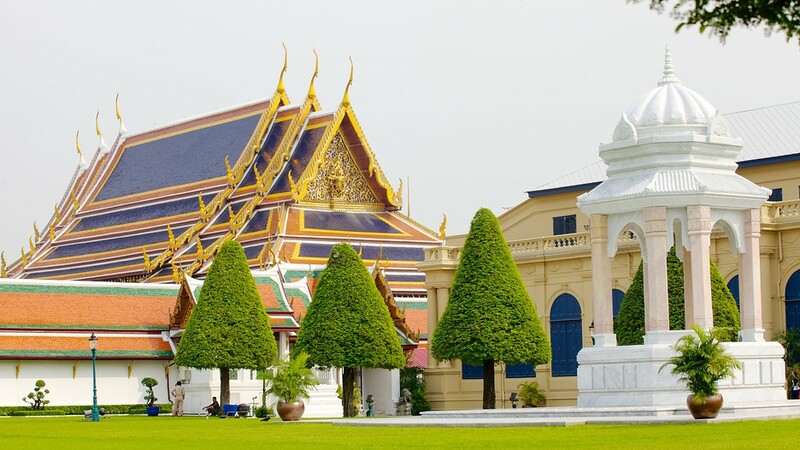 We will also pass the Grand Palace + Wat Arun, which we will visit the following day. The evening is yours for relaxing by the pool, receiving a Thai massage at the spa, or exploring Bangkok’s open-aired night market. After a delicious buffet breakfast, we will have a private group tour guide show us around the Grand Palace, Wat Pho + Wat Arun. 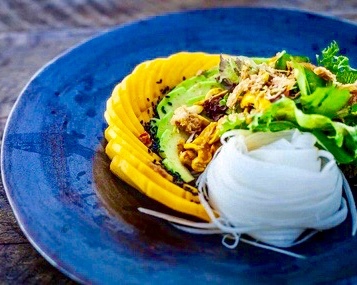 After a delicious buffet breakfast, we will take an airport shuttle + fly 1-hour from Bangkok to the island of Ko Samui, which is an ideal place for learning Thai Yoga Massage due to its outstanding natural beauty of palm trees, white sand, purple sunsets, turquoise waters, dense jungle + exotic waterfalls. 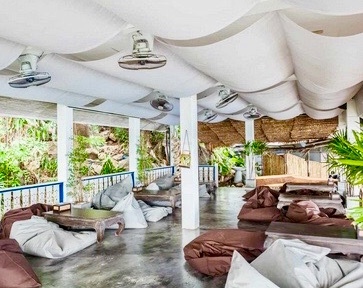 Our accommodations in Ko Samui will be at a stunning eco-friendly oceanside yoga retreat center. Rooms are simple and modest, yet offer similar amenities of a modern hotel. The location is majestic + awe-inspiring. Our classroom is an open-air yoga pavilion with hardwood floors + breathtaking views of the sea. Imagine listening to the sounds of the ocean while learning + practicing Thai Yoga Massage. 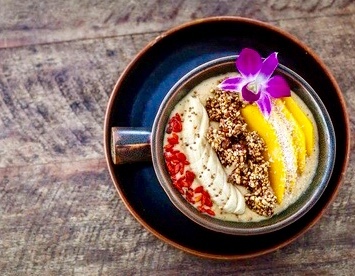 Optional evening activities include exploring the beach, complimentary yoga + meditation classes, a full service spa, an infinity pool + state-of-the-art gym. 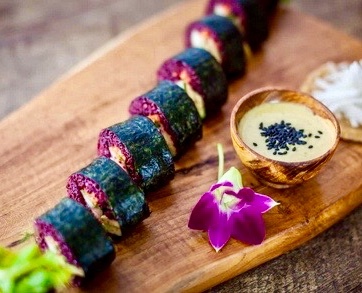 After settling in + having a delicious lunch, we will begin the 54-hour Thai Yoga Massage course. We will practice learning Thai Yoga Massage for 4 days, take a day off + resume for 3 additional days. We will spend the first half the day touring an ethical Elephant Sanctuary, the first of its kind in Southern Thailand. The tour offers us the opportunity to learn about the importance of these phenomenal, majestic giants, with a unique opportunity to feed, walk with + observe the elephants as they forage, socialize + play in their beautiful purpose-built pool. A delicious vegetarian Thai buffet lunch is included. After a mid-afternoon break, we’ll enjoy a sunset dinner cruise on a 100’ long sailboat with traditional Thai style sails. We will continue our Thai Yoga Massage training for 3 more days. After a delicious buffet breakfast on our last day, we will fly 1-hour back to Bangkok, where you are welcome to continue with your travels or return home feeling refreshed, rejuvenated + excited to practice your newly acquired skills! 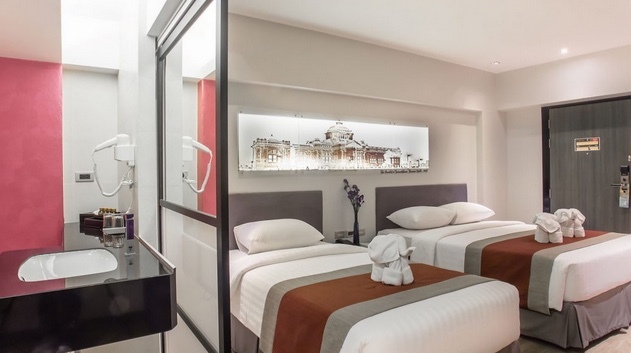 We will be staying at a 4-star, modern boutique hotel that is centrally located in Bangkok. Each spacious 350 sq. ft. room has all the amenities to make your stay very comfortable. A cozy atmosphere welcomes all travelers with decor that complements Bangkok’s historic + vibrant surroundings. We will be staying at an eco-friendly oceanside yoga retreat center in Ko Samui, an island that is a 1-hour flight from Bangkok. Rooms are simple + modest, yet offer similar amenities of a modern hotel. Bridging the gap between a hotel room + an authentic Thai experience, the Yoga Caves are small, but very comfortable rooms that offer sweeping views over the sea + rocks below. Relax on your comfy bed facing out over the ocean + take in one of the best panoramas on Ko Samui. Sleep, read + meditate in peace. Modest in terms of size, but still to high standards, the air-conditioned Yoga Caves offer a quiet, personal place to stay for individual travelers. The yoga caves do not have bathrooms en-suite. There is a large shared public restroom + shower facility located just behind the block of Yoga Caves. The Beach Bungalows bring you close to nature while providing every convenience. The rooms are modest, rustic both inside + out, yet clean + comfortable. They feature a queen-sized bed + direct beach access. 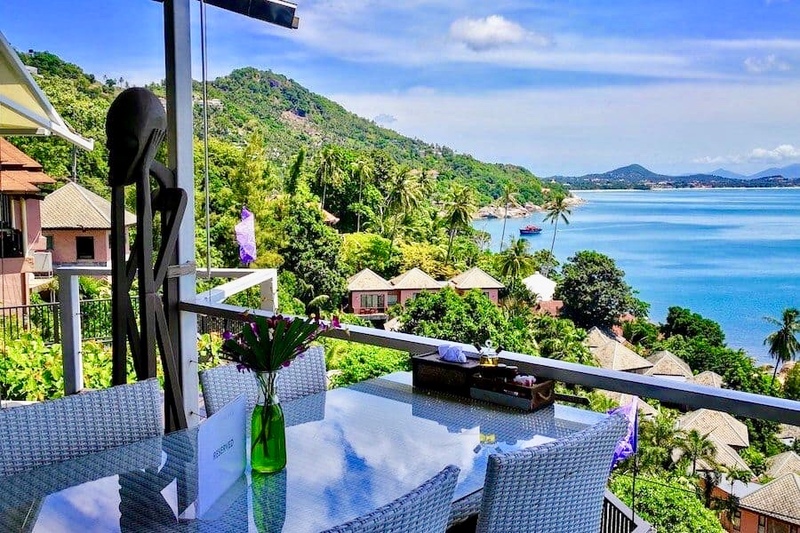 A private terrace allows you to take in one of Ko Samui’s spectacular sunrises. The price does not include round-trip airfare to/from Bangkok, optional activities, some meals + personal expenses. *Content of this travel package is subject to change. Pricing is based on payment in the form of cash or check. For debit/credit cards, a $100 fee will be added to cover bank fees. The costs below are for each person who is participating in the 54-CE hr workshop on this journey. Click on the red buttons below to pay with a debit/credit card. Space is limited for each of these accommodations, which will be allocated on a first-come, first-served basis. You are welcome to bring adult travel companions at a reduced cost if they are not participating in the Thai Massage workshop portion of this trip. The costs below are per travel companion. To ensure our sustained commitment to this training/travel adventure, a $750 non-refundable deposit is required to reserve your spot. No refunds will be given after November 14, 2019. Please plan carefully. If, for some reason, the trip is cancelled, you will receive a full refund. Deposit + 3 installments of the balance. Please contact Eric for details. Prices increase by $300 after June 14, 2019. Please download this travel agreement. Then read, sign + return to Eric. Thank you!